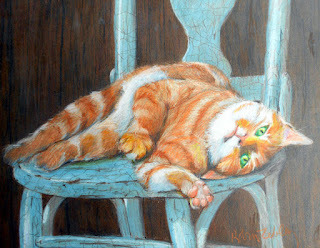 Orange striped kitty cat portrait, this fellow naps in a barn on an old vintage chair. I enjoyed creating the different textures on this one, the rough barn wood, the smooth yet crackled paint, and of course, the softest thing...a purring cat! Be sure to visit my other pages to see more custom portraits of pets, find out who I am (do I know?) and how to order. And I'll be talking more about each of the portraits I do, so join the ride! Also on Facebook, "like" me? I am an unusual artist, because I LOVE commissions, and the whole process. I enjoy getting to "meet" you and your animal, and helping to create art that is so meaningful. My clients tell me that I have an uncanny ability to capture their pet's personality. I can paint them in oil on canvas or board, or colored pencil on paper. I started out with colored pencil and they are so popular! By popular demand, I have also started offering portraits of kids in colored pencil. And that has been just as much fun as the animals! Have something else in mind? Boat, house, vacation scene? Just let me know and we can do it! Be sure to visit my other pages for lots more info and more samples! Anyway, about this kitty, I did it on my ArtandAnimals.blogspot.com blog as a demo. I am asked often how I get a painterly look in colored pencil, so did a step by step demo. I doubt I'll do it again. I get lost in the work and don't stop and remember what color pencil I used, etc. But he sure makes a nice sample, doesn't he?